Their band name is rather interesting, some may say perplexing: Highlight Kenosis. Kenosis is not exactly a word one may have in their vocabulary, let alone know the meaning of. It's a word specific to Christian theology meaning 'the relinquishment of divine attributes by Jesus Christ in becoming human.' (It's developed from the an interpretation of Philippians 2:5-9.) One wonders if this is just one of two words they picked to put together for the name or it has some significance to the band. If it's the former, I'm glad they didn't pick 'uranus hurts.' Actually, it's the latter as guitarist and composer Matei Damian-Ulmu calls Jesus one of his heroes. 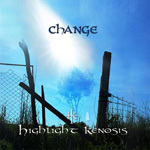 Highlight Kenosis offers their second album Change, an interesting mixture of melodic rock and metal with prog nuances. Female vocalist Oana Maria Stoica has a strong and clear presence, with neither an operatic, common in the genre, or metal style. She seems mostly a rock singer, with a pop timbre. This is notable on Change the World. Yet she can also be quite ethereal, even haunting as on the closing piece Outro ... With Angels. As for the music, its often edgier and sometimes a bit more intricate. Mostly this comes from Matei Damian-Ulmu's composition which feature a dense guitar structure peppered with good solos. There's a light use of keyboards, but it merely provides atmosphere. Likely the best tracks for prog accents come on Change the World and Loving a Ghost. The larger dilemma for Change is that its a rather short album, at 32 minutes, with only eight songs, two being an intro and outro. Let's hope for something more expansive the next time around. Otherwise, recommended. On the rather short Change, Highlight Kenosis offers a good mixture of melodic rock and metal with some prog nuances with entertaining results.